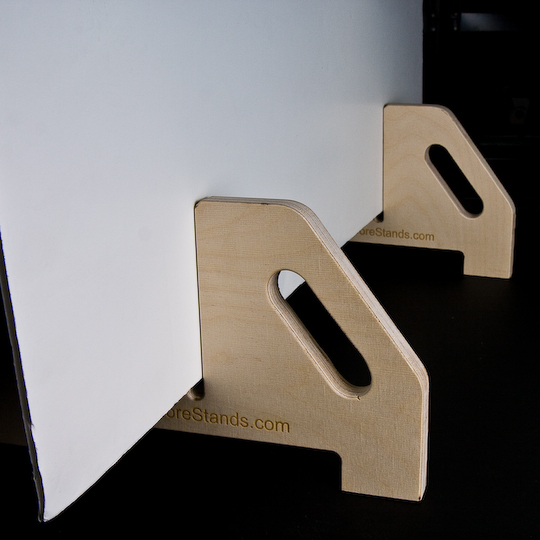 These Foam Core Stands are designed to hold a piece of foam core vertically. Ideal for supporting signs or for presentations. For photographers this can be used as a reflector, background, or to block light. There are four models available. The Large stands (shown on the left) are made from wood and are designed to support large 4'x8' foam core sheets. The slot can accomodate 3/8" or 1/2" thick foam core boards. 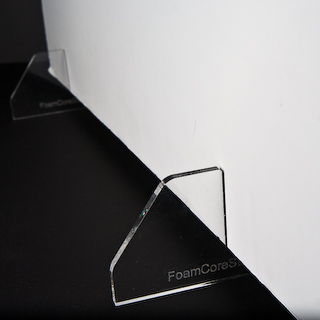 These small acrylic stands are designed to support small foam core boards up to 3'x4'. The slot size is available as 3/16"(standard) or 3/8" .